First published in the New Unions blog: newunions.wordpress.com. The gathering began in the middle of Ramallah, at al-Manara circle. Participants from labor and farmers unions, women’s organizations, and other left and progressive forces gathered in circle. There, they chanted slogans condemning the occupation and the assaults by capital on the Palestinian poor and working class. 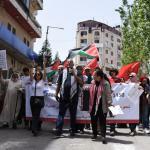 Demanding political unity and government action, they began a march along one of the main streets of the city, heading towards the seat of the Palestinian Authority (PA) president at the Muq’ata. While PA traffic police cleared the roads, plainclothes officers followed the demonstration. The march proceeded to the edge of the city where it was blocked from reaching the presidential complex by a line of PA riot police, supported by other police and military personnel. Plainclothes and uniformed police also openly filmed demonstrators. In spite of the increased police presence, demonstrators gathered at the police line to continue their protest, which dispersed sometime later without further escalation. The Minimum Wage Campaign, of which the New Unions is a member, began in 2014. A project of various left and progressive forces, it seeks to address the interconnections of the class and national struggles. One of its central goals is to lift the minimum wage, which currently stands at 1480 shekels a month (about $400) to 2480. Organizers see this demand not simply in terms of wealth redistribution. In the context of Israeli settler colonialism – which spreads through the slow destruction and deformation of Palestinian ownership, labor, and production – an increase to the minimum wage serves as a vital safety net that could allow Palestinians to better resist exploitation by Israeli capital and build alternative economic relations that sustain community and protect land and resources.